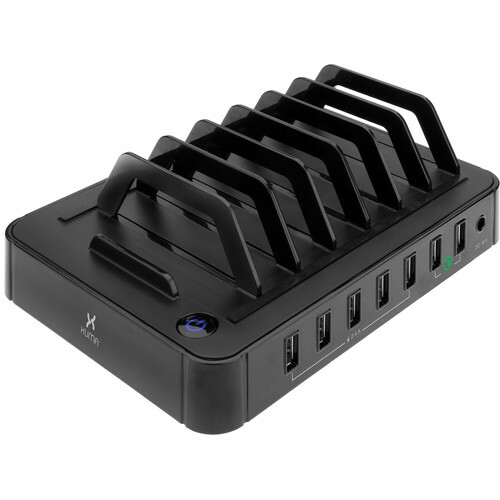 Charge up to seven devices at once with the Xuma 7-Port USB Charging Station with Qualcomm Quick Charge 2.0 Technology. This station features seven USB ports putting out up to 2.4A each, including a pair of ports with Qualcomm Quick Charge 2.0 certification for powering up compatible devices at rapid speeds. The station puts out up to 15.2A at 76W when all of its ports are utilized. Integrated smart chips recognize your devices and tailor the station's power output to match the devices' requirements. Seven dividers along the top of the station and grippy rubber strips provide a convenient location to store your charging devices, with one acting as a stand for media viewing. For maximum protection, the station guards against power surges, short circuits, and high voltage and current. Box Dimensions (LxWxH) 8.189 x 7.953 x 3.15"
7-Port USB Charging Station with Qualcomm Quick Charge 2.0 Technology is rated 4.8 out of 5 by 5. Rated 5 out of 5 by JWH in TX from Xuma USB Charging Station I purchased this charging station to consolidate the daily charging of 2 cell phones and 3 tablets. So far it has worked very well and takes up much less space than separate chargers. I also purchased short (1 ft.) USB cables that take up much less room than those that came with each device. Rated 5 out of 5 by Wesley W. from Portable devices all cahrged. So many portable devices to much clutter. This is the best solution in eliminating it all and organizing it into one cool unit. doesn't come with cables -- so don't forget to buy them -- I used 6 short cables. Rated 4 out of 5 by Haitham Abdulwahid from It's a nice station I use this kind of charging device for the first time. It makes me gather our?phones and tablet in one place so I can follow them. It has fast charging.? I think if it larger somewhat it will be better. Could a classroom use this to charge 6 ipads at once? Probably could, you'd have to buy the correct cables. We routinely charge 6 to 7 smart phones and/or battery packs using USB Type A to USB Micro. Been a great little unit, even with 7 devices charging, the AC to DC converter doesn't get warm. is this a 110-220V power supply?